Hotels Dolomites, Italy. Guide of Accommodations and Hotels in the Dolomites, Italy. Dolomites are montain groups in the Alps, that they extend among the provinces of Trento, Bolzano and Belluno. They are delimited at north from the Rienza river and from the Pusteria Valley, at west from the Isarco and Adige rivers, at south from the Brenta river and east from the Piave river and the Cadore area. The existence of Dolomites d'Oltrepiave, situated to east of the Piave river and the Brenta Dolomites, located in the western Trentino, evidences the conventional nature of this territorial marking out. Dolomites takes the name from the French naturalist Déodat de Dolomieu that he first studied the particular type of predominant cliff in the region. The genesis of this type of cliff begins approximately 200 milions of years ago through accumulates of shells, corals and seaweeds. Nowadays they are candidates to become world-wide patrimony of the Unesco, even if in truth they are already considered the most beautiful mountains in the world: the dared and colossal mountains shapes, the color of the stone that it changes according to the day light, the deep valleys, the alpine lakes create an unique scenery. The Dolomites region is a fully touristic vocation zone since the Austrian empire times, when nobles and the emperor himself came to spend the summer period here. Nowadays the small villages have transformed into large localities full of lodge, residence, hotel and any kind of tourist accomodation. The winter season is mix of technology and beautiful panoramas: the modern, fast and comfortable lift systems connect skiing tracks of any range of difficulty, always snowed. In 1974 it has been created the "Dolomiti Superski", a consortium of several lift systems managing 1200 km of tracks, representing the most equipped skiing area in Europe. The famous localities like Madonna di Campiglio, Cortina d'Ampezzo, San Martino di Castrozza and Corvara are among the most demanded destinations in the Alps. In the summer season Dolomites transforms into an immense arena dipped in an uncontaminated nature. The routes to cover on foot or in mountain bikes are infinites, adapted to every ability, that they cross woods and parks, alpine torrents and small lakes. The rocky walls of the Dolomites represent moreover an ideal place climbers, but it is possible to practice also other sport activities as horse riding, golfing, paragliding and rafting. Book a hotel on the ski in Dolomites! For your skiing holiday week choose to stay in a hotel or accomodation close to the ski tows. 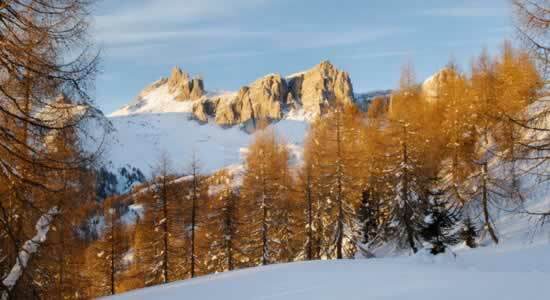 Check our offers for weekends and skiing holiday weeks in hotel in Dolomites by the ski runs. Don't give up the pleasure of leaving the hotel with your ski is on! Hotels with parking in Dolomites ? If you have decided to travel to Dolomites by car or motorbike, don't worry about finding a parking space or leaving your vehicle unattended. Display the list of hotels and accomodation in Dolomites provided with a parking place or a garage. Book a hotel in Dolomites with a parking area! Pet-friendly hotels in Dolomites ? Don't leave your dog at home. Use our guide to check the list of hotels and accomodation that welcome dogs in Dolomites. It is also possible, from our selected list of hotels and accomodation where animals are allowed in Dolomites, to keep your dog in the room with you! Check our offers of hotels and accomodation in Dolomites with rooms equipped for the disabled! For your stay in Dolomites, book a hotel accessible to disabled people. Choose your hotel in Dolomites from the list of hotels equipped to welcome disabled people! Wi-Fi hotels in Dolomites ? Are you looking for a hotel or accomodation with a quick internet access and wi.fi? Click on the list of hotels in Dolomites which have a wireless connection to internet and wi.fi. Gay-friendly hotels in Dolomites ? Look for gay friendly hotels or gay friendly accomodation in Dolomites, choose to sleep in a gay friendly hotel or gay friendly accomodation in Dolomites! Take advantage of our offers of gay friendly hotels or gay friendly accomodation to book your holidays in Dolomites.